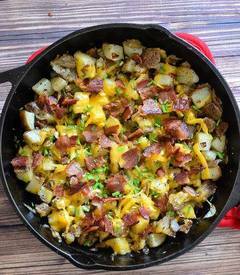 Cheesy Bacon Home Fries are a product of leftover baked potatoes that have been sauteed in a combination of Bacon fat and butter then topped with cheese, crumbled Bacon, and chives. Growing up, I always would love when my Mom would make home fries. While as a child, mashed potatoes or baked potatoes weren’t my thing, I was completely infatuated with home fries or french fries. Um, who wouldn’t be, right?